NOTE: Yesterday I posted that I, and two other garden bloggers, would be sharing a space and selling at the Long Beach flea market tomorrow. That post was based on an erroneous assumption on my part and has been removed; we will actually be selling at the December 15th flea. I apologize for any confusion this mix-up might have caused. 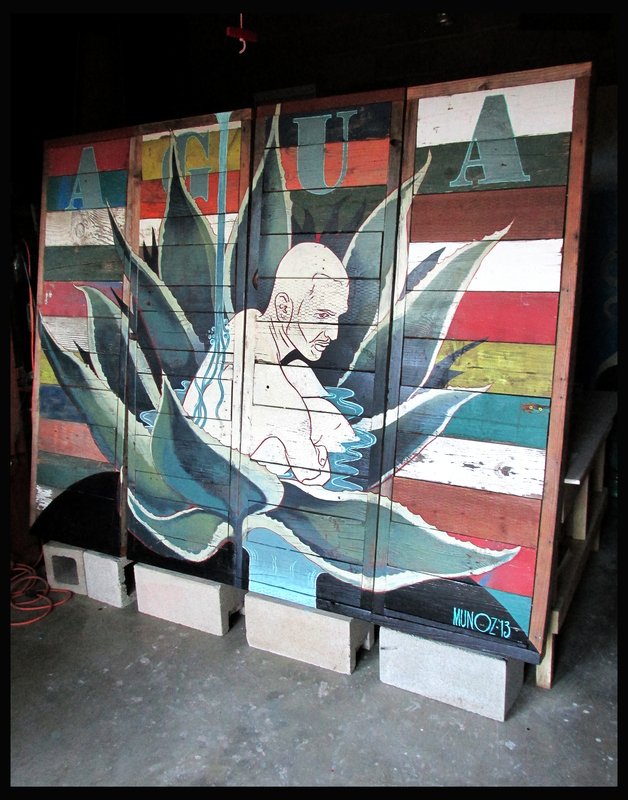 Silver lining: My offering, a “portable mural” titled ‘AGUA’, is finished a month ahead of time … I think I’ll go lie down now. Thank you! That is very nicely-done…if only I had a blank space! Hoping for much of that agua in your upcoming wet season, as well as ours (7 months to go…). “Agua” is beautiful. That would be so pretty on the wall of my rancho. We are finally out of our rainy season, now the winds start. I really love that mural — perfect for Austin! If only I lived in SoCal and could come to the flea market meet-up. I’d love to meet you all, and see Denise again, whom I met at the Garden Bloggers Fling in S.F. this summer. I will,….fingers, legs, and eyes!! !